Researchers from Yale University have developed an extremely thin coating, which in due course could improve the life expectancy and efficiency of lithium-sulfur batteries. 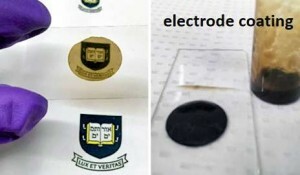 The new material is a dendrimer-graphene oxide film which can be applied to any sulfur electrode. According the the researchers, sulfur cathodes that have been coated with this material remained stable through more than 1000 charge/discharge cycles, which obviously increases the efficiency and life-expectancy considerably. The coating (film) is sufficiently thin so that the dimensions and the weight of the battery – and therefore also the energy and power density – are not affected. New electrodes are essential for the development if a new generation of batteries with high energy density. The capacity of lithium-ion batteries is starting to reach its limit; many researchers are therefore looking at lithium-sulfur as a possible solution. Sulfur us abundant, is light and has, according to theory, a high energy capacity. With existing lithium-sulfur batteries however, the capacity drops quickly as the number of charge and discharge cycles increases. The new material combines the mechanical strength of graphene oxide with a dendrimer molecule that can exclude lithium-polymer sulfides . The result is a gel-like mass that can be applied without any difficulty as a 100 nm 'thick' coating to the sulfur electrodes.